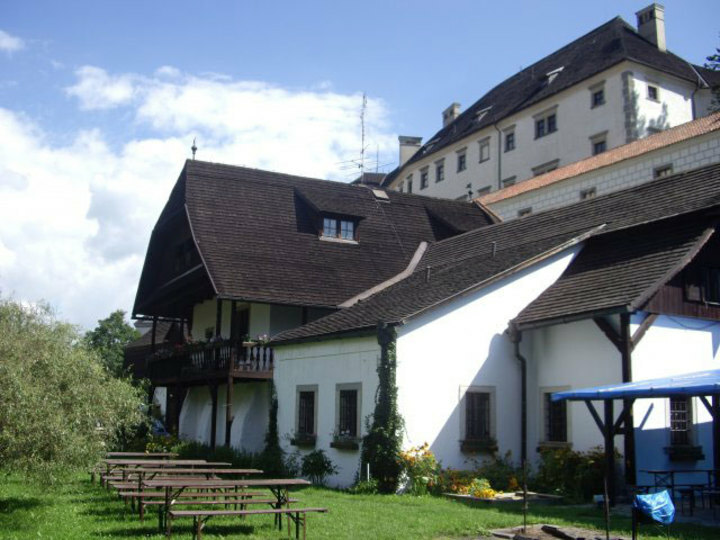 Our hostel is situated in a romantic environment below the castle and by river Nežárka. It's the right place to relax, have a barbecue etc. We invite you to our newly remodeled penzion, hostel and restaurant located in a romantic environment directly bellow the castle, by the river called Nežárka. In the unique tanner houses can be accomodated up to 60 persons. We are looking forward to your visit., In our area you can find restaurant with fish specialties (capacity 100 persons), whith is located by the river, grill and rotisserie are available for open air parties (capacity 150-200 persons). Parking in the secure area is included. Bike and boats rentals, shoping in the art gallery or excursion to Tapestry workshop ATT since 1910 could be another option how to enjoy your stay in Jindrichuv Hradec. Das Hostel befindet sich in einem historischen Gebäude und liegt sehr romantisch zwischen der Stadtmauer und dem Fluss. Das Bett und die Möbel in meinem Zimmer waren sehr einfach. Das Frühstück war sehr gut und reichlich. Booked 2-bed room but had large scruffy room at top of hostel, lots of steps, toilet on a different floor. Entrance and reception hard to find.